The Fourth Judicial District Commission on Judicial Performance unanimously recommends, by a vote of 7-0, that Judge Edward S. Colt BE RETAINED. Judge Colt was appointed to the District Court in the Fourth Judicial District in August 1999. He currently presides and is chambered in Teller County. Prior to his appointment, Judge Colt was a part-time judge for the City of Colorado Springs and in private practice. 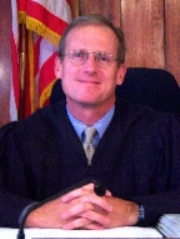 Judge Colt received his undergraduate degree from the University of Colorado and his law degree from California Western School of law. Judge Colt has been active in many community service activities, and since his appointment he has demonstrated his commitment to the community services through volunteering as a judge for Moot Court and Teen Court, when needed. The Commission conducted a personal interview with Judge Colt, reviewed opinions he authored, observed him in court, and reviewed surveys sent to attorneys and non-attorneys. Among the survey questions was “how strongly do you recommend that Judge Colt be retained in office, or not be retained in office?” 84 attorneys and 256 non-attorneys responded to the survey. Among the attorneys, 90% recommended Judge Colt be retained, 6% recommended that he not be retained, and 3% made no recommendation regarding retention. Among the non-attorneys, 93% recommended that he be retained, 6% recommended that he not be retained, and 3% made no recommendation regarding retention. (These percentages may not total 100% due to rounding). Among non-attorneys, Judge Colt had slightly below average scores or below average scores for demeanor, fairness, communication skills, diligence and application of the law. Among the non-attorneys, Judge Colt had high scores for neutrality in his handling of criminal cases, with 80% believing he was “completely neutral”, 12% believing he was biased in favor of the defense, and 11% believing he was biased in favor of the prosecution. Among the attorneys surveyed regarding Judge Colt’s handling of criminal cases, 63% believed he was completely neutral, 9% believed he was biased in favor of the defense, and 26% believed he was biased in favor of the prosecution. Among the attorneys who completed the surveys, Judge Colt was rated above average overall. His application and knowledge of the law, and his communication skills were rated above average, while his overall case management skills were rated below average. Judge Colt presides over all district court cases, including domestic (family law/divorce), juvenile, civil, and criminal cases. Based on the survey results, Judge Colt received an overall combined average rating which exceeded the average combined rating of all district judges standing for retention.